IT Band friction syndrome is an injury that is commonly found under the umbrella of “runner’s knee”. 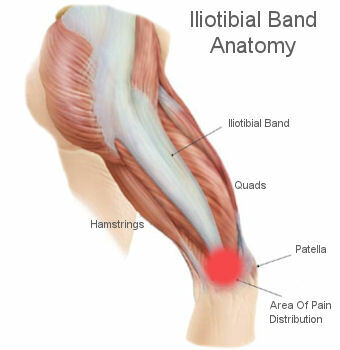 The Illiotibial Band (ITBand) is a very fibrous, tendonous like structure that attaches near the hip (to the Gluteus Maximus and the Tensor Fascia Lata) and runs down the lateral side of the leg to attach just below the knee. Most often this is an overuse injury that results in sharp stabbing pain at the lateral side of the knee. The ITBand becomes tight and every time the knee flexes it rubs against the boney prominences of the lateral side of the knee causing inflammation and very sharp pain. The problem with conventional treatment (ultra sound, ice, rest) is that treatment generally just addresses the symptom sight, the lateral side of the knee. The therapist can treat this area for an extended amount of time but the problem will not be resolved until the causative factors are addressed. The first step is to take a look at an athlete’s shoes to ensure that they are training in footwear appropriate to their foot mechanics. The next step is to address the muscle imbalances. The ITBand attaches near the hip with two muscles, the Gluteus Maximus and the Tensor Fascia Lata (TFL). Because of this superior attachment of the ITBand, these muscles can tighten up and cause a pull on the ITBand all the way down to the knee. The ITBand will not feel released until these two muscles are addressed. The lateral quadriceps muscle, the Vastus Lateralis is also a very important muscle to treat. The Vastus Lateralis is almost always tight in an ITBand problem but more importantly this muscle can also become adhered to the ITBand. The ITBand is a thin structure that lies directly on the Vastus Lateralis. They have a very close relationship but in a healthy leg they should move independently. Often in ITBand friction syndrome they become adhered and move as one unit instead of moving as two separate structures. They have different jobs and need to move independently to accomplish their role effectively. If the adhesion’s between the two structures are not broken up, the ITBand problem will never completely resolve. The Peroneal muscles attach at the lateral side of the leg just below the knee, pass down the lower leg and attach at the lateral and plantar aspects of the foot. This muscle has common attachments with the ITBand, so when the ITBand is affected this muscle is also affected. Athletes suffering from ITBand problems are often instructed to take extended time off. Unfortunately, if nothing is done to address the causative factor the problem will return as soon as the athlete resumes activity. Active release TechniquesÒ (ART) is by far the fastest and most effective way to resolve the muscle imbalances that are often found to be the cause of this painful syndrome. ART is a very precise manual therapy that lengthens the problem muscles while addressing any scar tissue or adhesion’s between the muscles involved. Did you find this blog helpful? Leave us a comment.